Stand by, following some organic commercial manure for a generous fertilization from your Minion Master! Your torture (Delete unapproved language. Replace:) enhanced interrogation is important to us. To serve you better, your torture (Delete unapproved language. Replace:) enhanced interrogation may be repeated several hundred times (Delete unapproved language. Replace:) twice because one definition of insanity is repeating a failed strategy and expecting different results (Delete unapproved language. Replace:) it always works when Jack Bauer does it on 24, and that's as close to a documentary as you can get. KEEP AMERICA STRONG! 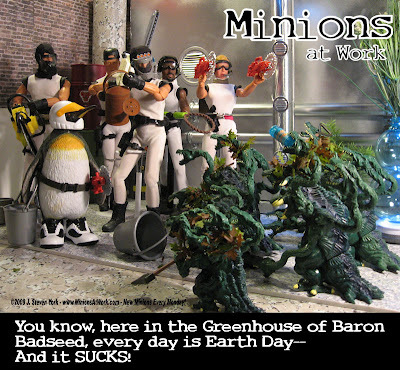 SUPPORT "MINIONS AT WORK" BY BUYING STUFF YOU WERE GOING TO BUY ANYWAY! Hey, while we're cleaning up at Minions Studios, I decided it would be a good opportunity to clear some slightly soiled factory seconds out of our Bulging Warehouse of Doom (Bulging Warehouse of Doom would, by the way, be a great name for a rock band) and give you guys a twofer this week. 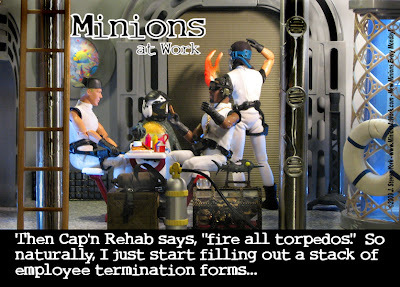 So there's a second Minions at Work cartoon following this message. Also, if you had to scroll down here, I figured there's at least a slightly higher than usual possibly that you'll actually read this crap! Okay, failing that, how about a good, old-fashioned book? You know, something with a semi-dressed person on the cover. You know. Literature. And if you're too damned cheap to buy anything, how's about leaving us a comment? We love to hear from you almost as much as we like getting money. Well, not really, but it just barely beats out a poke in the eye with a sharp stick. "Arbor Day? That's the day all the ships come back into the Arbor." said Sally Brown from Peanuts. I was looking through the lair of merchandise and I wondered if you shipped to the UK (and how your prices translated to pounds sterling). I'm sure I'm not the only non-American fan out there, so would you let us know? Avocado_Triffid: For an answer to your questions, see this week's post (#164).